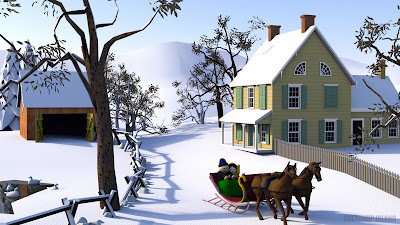 This is a SketchUp 3D model rendered with Shaderlight, depicting a Currier & Ives inspired scene. To Trimble SketchUp 3D modelers around the globe, have a happy and safe New Year! This was an awesome holiday 3D modeling collaboration from two years ago. Have a look! And have a happy holiday too! 3D modeler Lakitha Keshan Perera sent me this beautiful model of an old timbered building in Svendborg, Denmark. Check it out! If you'd like to see your models published like this on the blog, just contact us through the link in the left column, and provide your model's link and where you think it would fit (or look at our collections and contact us through the "contact the owner" link within each collection). We'd be glad to give your model consideration! 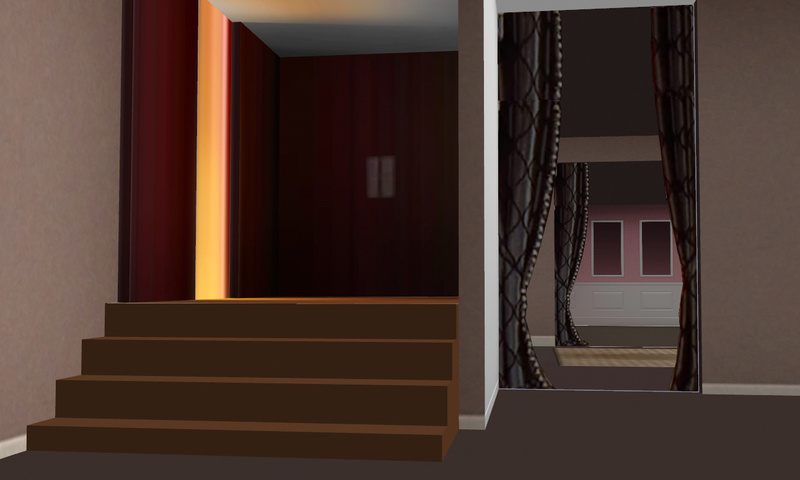 3D modeler MILO Minderbinder shares with us a brand new model in his favorite architectural style, Art Deco. Check it out above and thank you MILO! A SketchUp Island reader reminded me of the great models made by 3D modeler Aerilius. I perused many of them, organizing some into collections. Here I share one of my favorites. 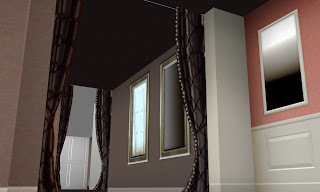 3D modeler Lakitha Keshan Perera has sent me a link to his latest, uploaded November 30, 2012. It is an ancient pyramid found in Mexico. What do you think? I saw the model above by 3D modeler St. Pall on a Google Plus post and thought I'd share it with you. While you're at it check out his entire model collection which has many other beautiful ones like this. SketchUp Island by the way now also has a Google Plus stream. If you enjoy following along that way, please do! 3D modeler extraordinaire MILO Minderbinder writes "I've been away for awhile, but now I return with one of my greatest models." Check out Transportation terminal Rotterdam as seen above! I just discovered this great collection of 3D building models in Panama City, Florida by Jason Combs. Seen above is Jason's model of The Bagel Maker, an award-winning bagelry in Panama City. It is typical of all the models in the collection in that it is neatly and completely done with clean, beautiful textures and simple but effective geometry. My favorite kind of geo-model! Lakitha Keshan Perera, a student, 3D modeler, and fellow SketchUp Islander, often suggests models for me to add to 3D collections. Here is one of his favorites made by Damo, all the way back in 2008! I had the pleasure of meeting Damo in Zurich when Mappers and 3D Modelers gathered for a summit. What do you think of his mad modeling skills? Above we have First Baptist Church by Randall Crane, who is always submitting models for our perusal from the ever-growing Evansville, Indiana collection. In a few short days I'll be leaving SketchUp Island to join many others from around the country and globe in Boulder, Colorado, for the fourth-ever 3D Basecamp! This will be my personal third SketchUp conference event, but the first 3D Basecamp I have ever attended. I look forward to it! Today I finally got my flight booked. The hotel, which I'll share with a couple familiar faces from the SketchUp world, has been booked too. Lots of people to meet, friends to see again, and things to learn. Hope to see you there! And for those who don't go I will record my journey and share it on the blog. Check out the amazing top three winners, plus some shortlisted ones, in the Shaderlight rendering contest from July. The results have just been announced and you can view the official blog post here. "Last one for this block!" writes Randall Crane who is building the virtual version of Evansville, Indiana. Check out all of the models in his collection here. The following post was provided by our friend and fellow SketchUpper, Nick Oberg. 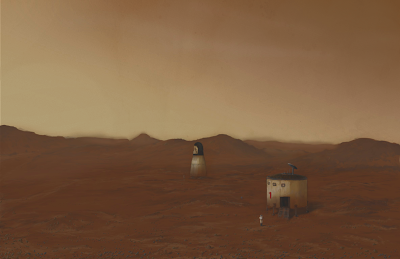 He explains how he made the beautiful Martian landscape seen above, and why. Before we get to that just a few news items! One, if you entered the Shaderlight rendering contest this summer, the announcement of the winner will take place this September at some point! Good luck to all who entered. What's this? 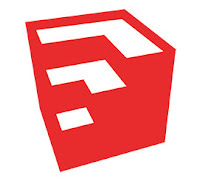 Answer: SketchUp has a whole new brand identity! 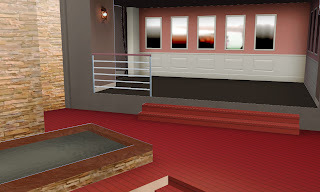 Check out the post by Aidan Chopra at SketchUp's official blog that explains why and how the SketchUp People came up with this new look. While you're at it why not check out the latest SketchUp 8 maintenance release? EDIT: Just navigating around the virtual 3D space in the new SketchUp release, using my 3Dconnexion mouse. It might be my imagination but the motion feels much more fluid to me now. This is my rendering that I will enter into the current Shaderlight sponsored contest. 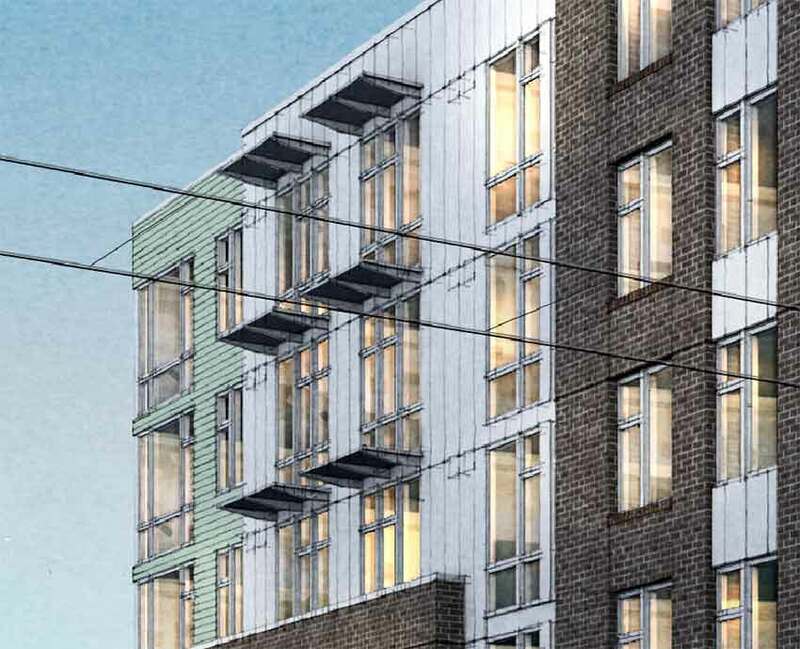 The image must be a SketchUp model rendered in Shaderlight, which this is. It was created especially for the competition (all items were modeled for this image). There are over 1 million geometric edges in the 3D SketchUp file, and the final jpeg took three and a half days to render! 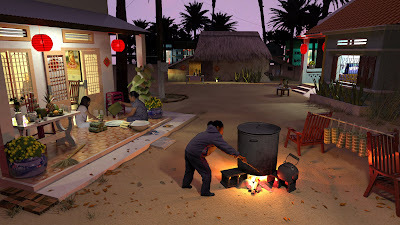 Depicted is New Year's Eve in a Vietnamese village. Everything is based on real life but the place is fictional and a combination of memories and research. EDIT: see some current entries to the contest here. EDIT #2: As of August 25, 3012, the Shaderlight people have received and are currently reviewing / judging entries. EDIT #3: For your convenience, a link to the article about winning entries! 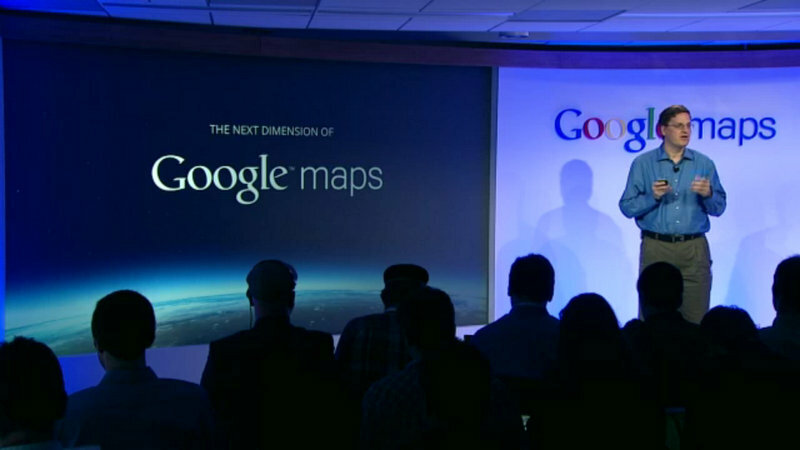 I was just catching the end of the live press conference "The Next Dimension of Google Maps." What they showed looks very cool-- a high res automated 3D model of San Francisco, complete with modeled trees, buildings, and terrain. Unlike the current situation, where many user generated models of varying styles with different lighting schemes collide in a potluck of 3D goodness, the new style map, or the new Google Earth, is modeled as one unified seamless mesh. It's as if you're looking at the real thing. I'm not sure where that leaves us geo-modeling enthusiasts. Maybe the large cities will receive this 'next dimension' treatment (rendering our current handmade models obsolete)-- but possibly the countryside will be ours to model yet? Maybe maybe maybe. It's all speculation on my part but I am very curious to know what this new direction, and the sale of SketchUp along with it, means to me and other geo-modelers worldwide. Labels: Google Earth, Google Maps, Why Model? 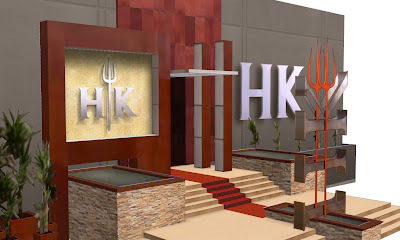 I've been working on this model of Chef Gordon Ramsay's Hell's Kitchen TV studio / restaurant in Culver City, California on and off for months-- hoping to get it done before tomorrow's US series premier of Hell's Kitchen season 10. Not happening! But-- I am posting some screen shots of what's done so far. Since the real building is found in sunny southern California the architecture allows for some hybrid indoor/outdoor spaces-- hence the transitional interiors. Hope you like it. I'm trying to get this done within the week. EDIT: With the official transfer of SketchUp to Trimble, and the announcement of auto-generated 3D cities for Google Maps, I'm not sure if I should continue work on this model, with the objective of getting it on Google Earth. Certainly Los Angeles will be one of the first cities to experience "Autopocalypse™" (I'm not totally against it, actually interested in it-- but all the same, it's weird). Happy 75th birthday to one of America's most famous landmarks, the beautiful Golden Gate Bridge located in San Francisco, California! A call to 3D modelers! Help 3D modeler Jay get St. Augustine, Florida, modeled! If there is anyone you would like to add to this group feel free! I am new to this stuff so I know it might not be that exciting to you but I am feeling great about it! So my main objective was to get this city going. 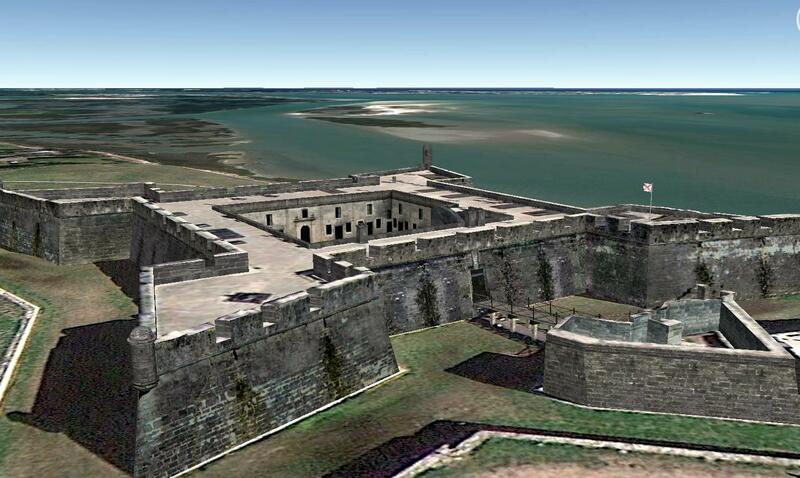 St. Augustine is the oldest friggin city in the US and there is virtually nothing on Google Earth... unacceptable! If you are able to contribute to a model in the area that would be great. If not that is fine also. Spread the word and lets get it going. It will be fun! Labels: Americana, Historic Building Models, St. Augustine Florida, Why Model? 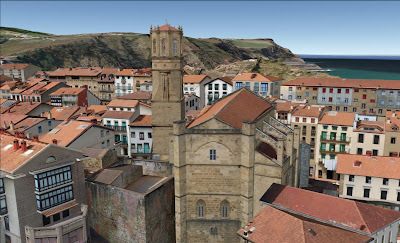 Congratulations to the Getaria, Spain team (Josetxo Perez Fernandez and Pedro Domecq Aguirre) who received the $25000 prize from Google as the winners of the 2012 Google Model Your Town contest! The model pretty much rocks. Read all about it here. Read this! 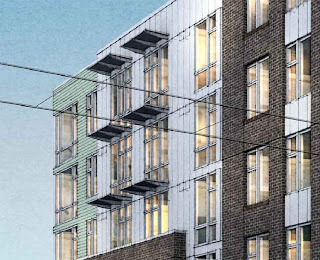 A very cool, readable article about how to create a non-photorealistic (NPR) architectural rendering by Scott Baumberger. He uses SketchUp, Shaderlight renderer, and Photoshop. The article can be found here on sketchupartists.org. Via the Google SketchUp Facebook page. Arrigo Silva's beautiful model regains top spot and its place on Google Earth after some dramatic improvements from fellow modeler Peterg / gipuzkoa3d. Sorry, Empire State Building. You are now officially the second tallest once again! Sometime today the new One World Trade Center eclipsed the Empire State Building as New York City's tallest building. Even though it is currently only 1,250 feet tall, at completion it will be 1,776 feet tall. In remembrance of the 100th anniversary sinking of the Titanic, Google has created an updated 3D model version on the Google Earth ocean floor, using imagery from National Geographic. Check it out! 3D Modeler Jean sent me this beautiful model of the Château Frontenac. Wow! Good job, Jean. This model has been added to my 3D model collections: Favorite Thumbnails, Castle, and 1890s. Model Your Town 2012: VOTE! Have you voted yet? I'm about to. Look at the video above for an overview of the six fantastic Google Model Your Town 2012 finalists. You'll help one town win a nice chunk of cash for their school district. Have a look at this link for more details and videos of each town's model collection. Then be sure to vote! Each person can vote only once, and voting ends May 1, 2012. Good luck to the finalists and congratulations on everyone who made an effort to enter! 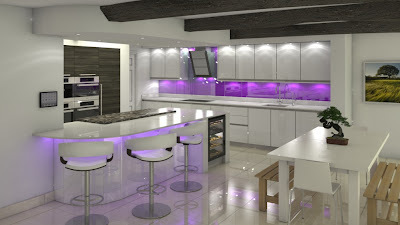 Nice model sent to me this week by 3D modeler Jay. Included in the 3D model collection 1880s.